Albus Dumbledeer and his girls. It is that time of year again, and our red deer are coming to the end of their rut. I love this time of year... The noise of the stags roaring, the sound of their antlers clashing, it really does echo around the whole Centre, but the thing that gets me the most every year is the smell! 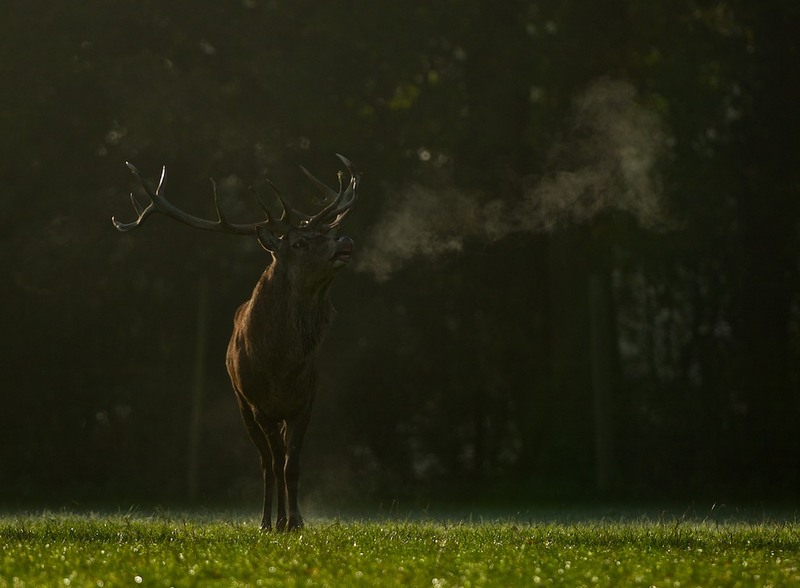 It is such a shame that I can't share this with you through photos, but if you get the chance to visit us at this time of year, head down to see our deer paddock and just take a good breathe in... the smell is incredible, it really hits you hard. A kind of musky, sweaty smell but not as unpleasant as that sounds. I have had little time to take photos this year unfortunately, and our mast stag is not in his real prime I would say, and the challengers are not there yet to make it a really good year... but there has been a lot of posturing, chasing, roaring and the like. Some of these photos are from previous years, but some like the one above are this years. 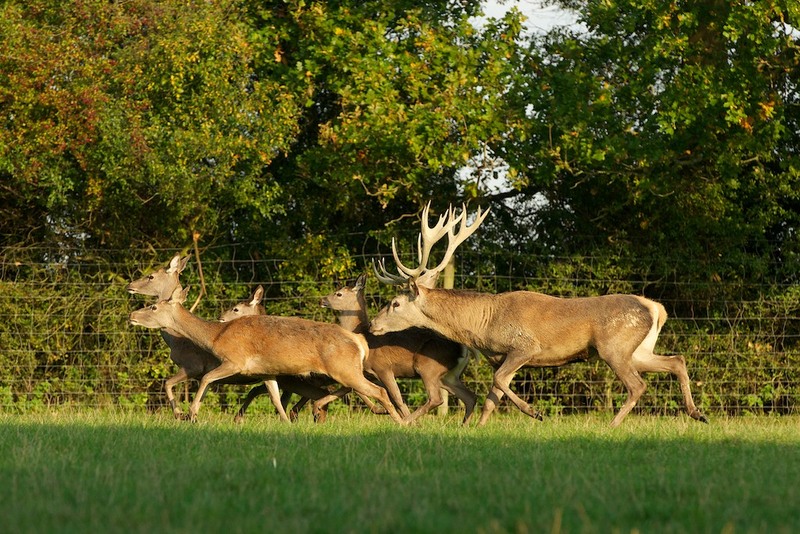 The rut is essentially the males competing over the females and preparing to mate with them. It is best looked at as a test of stamina. 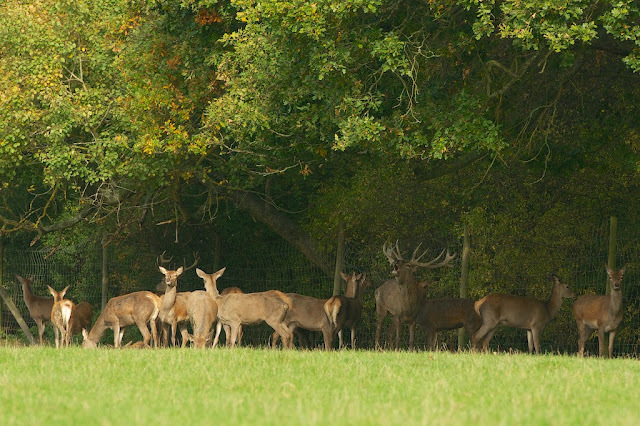 The rut will last for a few weeks over late September, early October, and during these weeks the stags rarely eat or sleep... they are too busy concerned with keeping the other males away and the females close with them. They spend a lot of time testing to see if the hinds (females) are in season. This is often just chasing them around, sniffing their rear glands or the ground where they may have just urinated, often flicking their tongue in and out to help pick up the scent. But it also shows them doing this strange behaviour called flehming. 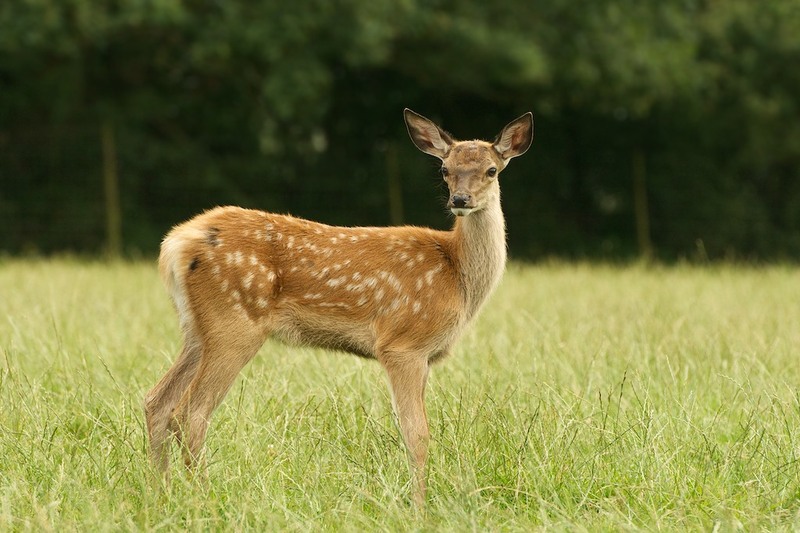 Flehming is when they curl back their upper lip and breathe in the scent in the air. By doing this they can moisten the air slightly, making it easier for them to pick up the scent to see if the hinds are in season yet. Once they are in season, then the real battle begins to keep the other males away so they can keep the hinds to themselves while they mate with them all. 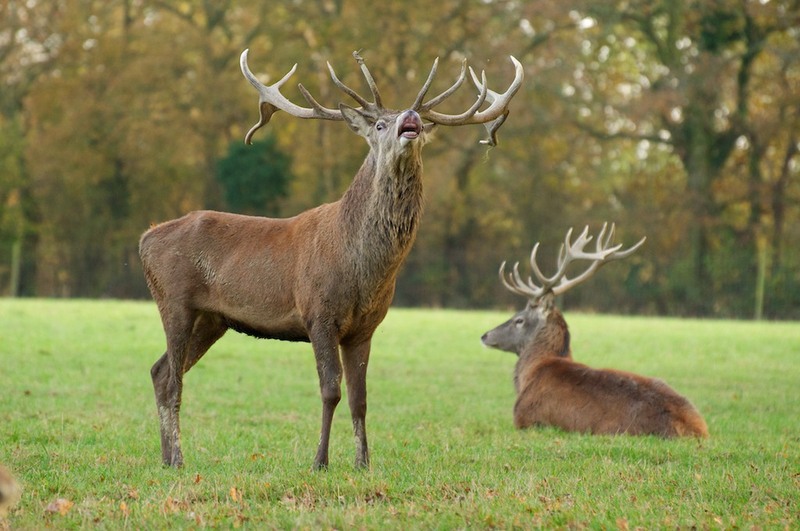 The stags need to make themselves seem bigger and more dominant. They will spend a lot of time decorating themselves in their own scent, to really make them stand out. This usually shows them urinating on themselves, and the ground around them... and then thrashing their antlers in the ground where they have just scented, and even rolling around in it too. 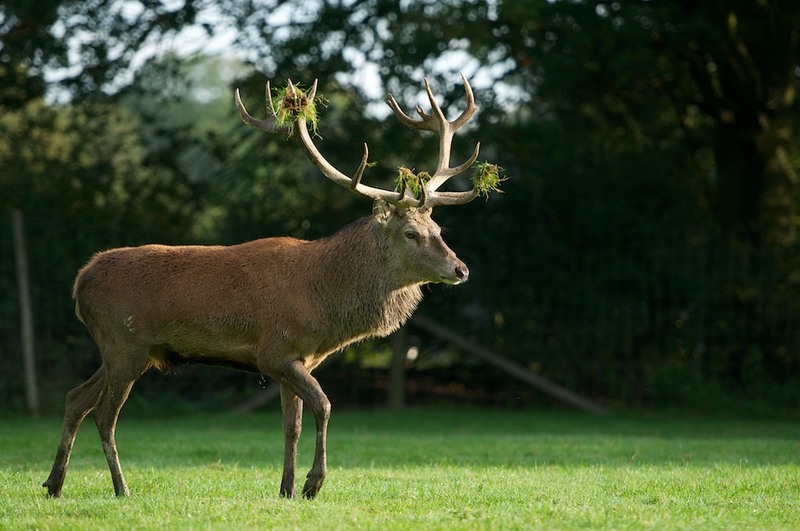 Once they are covered in their own scent, they often decorate their antlers with grass, branches and twigs etc from around the paddock. If other males are around they will size each other up, and if needs be start to push and chase those other males away to leave themselves alone with the herd of females. 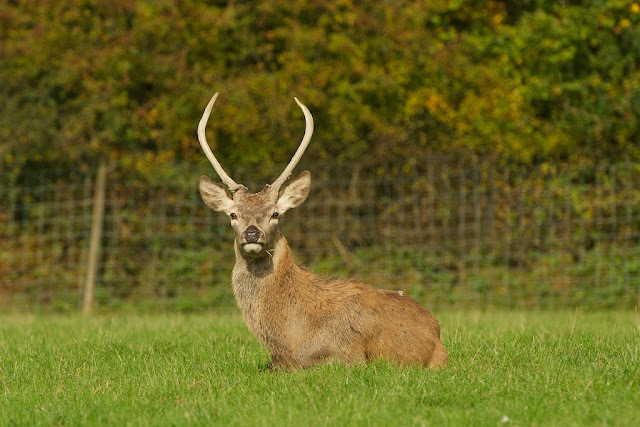 The much younger males pose no threat, and just bide their time on their own before being accepted back in to the group, but the slightly older ones take a bit more effort in keeping them away. 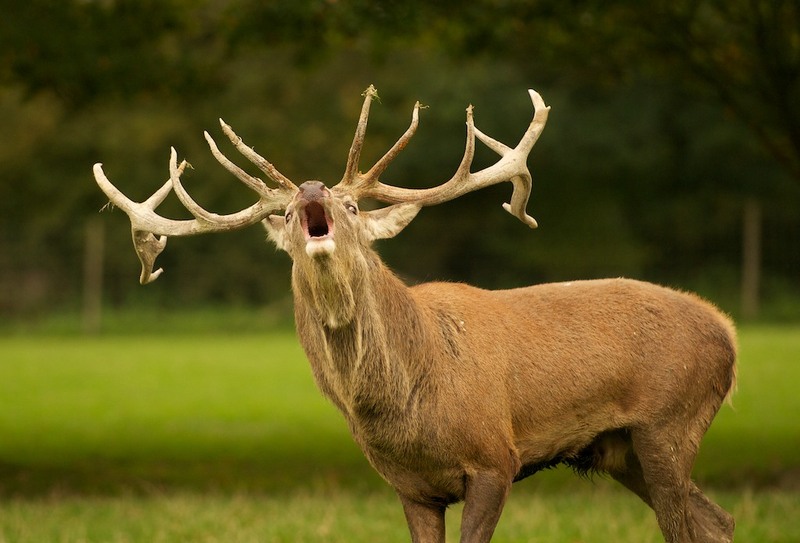 Whilst doing all of this, the master stag will be roaring to show off dominance and warn the other males away. He will continue to do this day and night while keeping the females together and other males away. 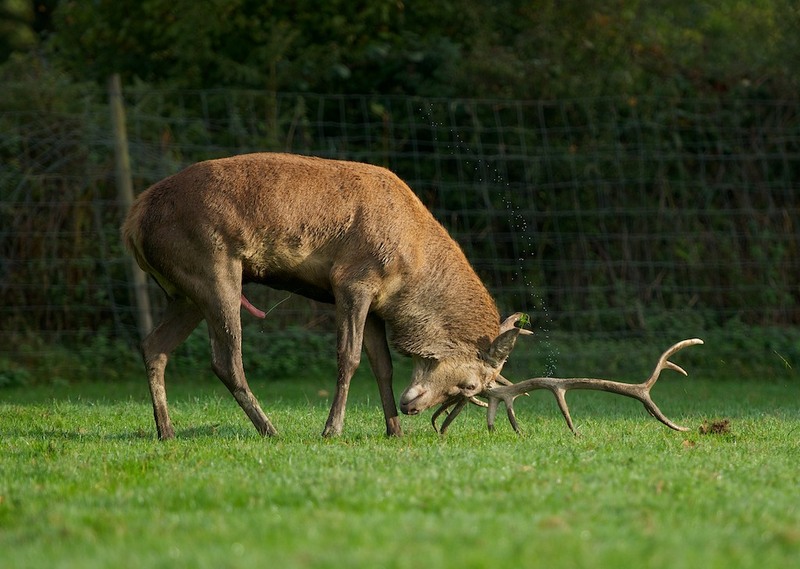 During the rut, the males get broader throats and enlarged scent glands under their eyes. 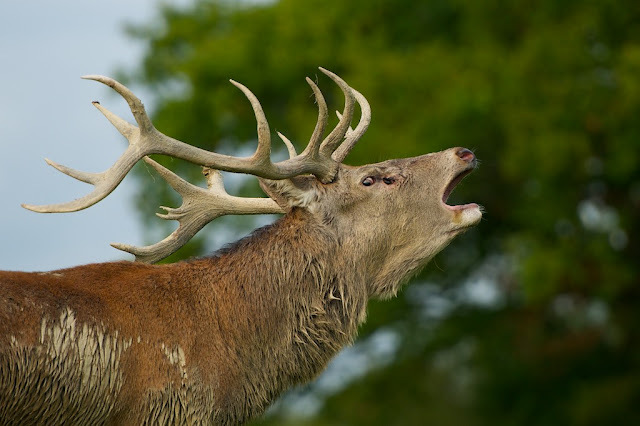 Scent comes from these glands and helps create the smell in the air. 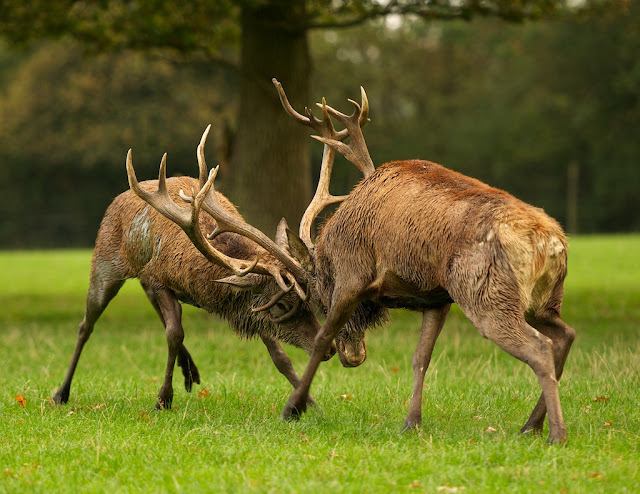 If none of this is enough to keep the other males away, then clashing of antlers may occur. 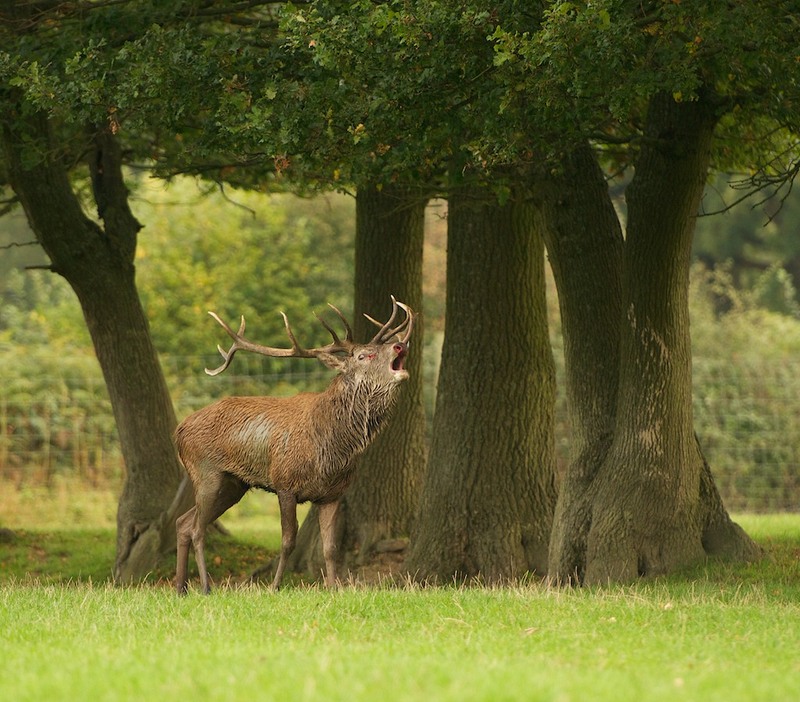 The best rut I have witnessed here was a few years a go now between Eric and Alfie. I could of posted a few dozen images of just that, but thought this would be photo heavy enough with all of these. 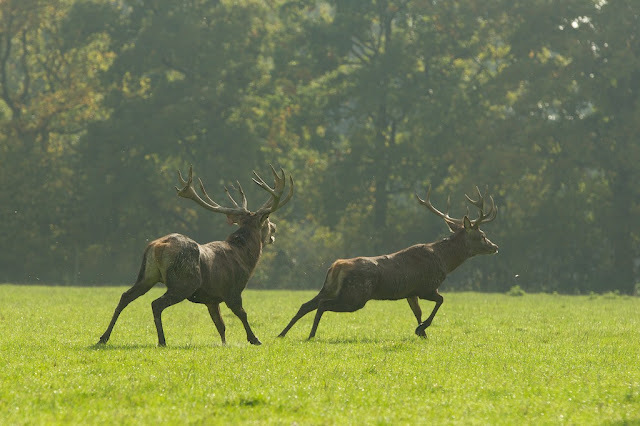 They really go at it, little run ups and thundering claps of the antlers together. To be as close as I was was incredible, but I don't think I would get that close again. I knew Eric well, very well in fact, and knew I could get away with it. I don't trust Albus as much! Look at how close they can get to damaging each other though, Eric's eye above in between two of Alfie's tines. Eventually the victor walks off, tired, but with enough energy to show his dominance and continue to keep the hinds together. 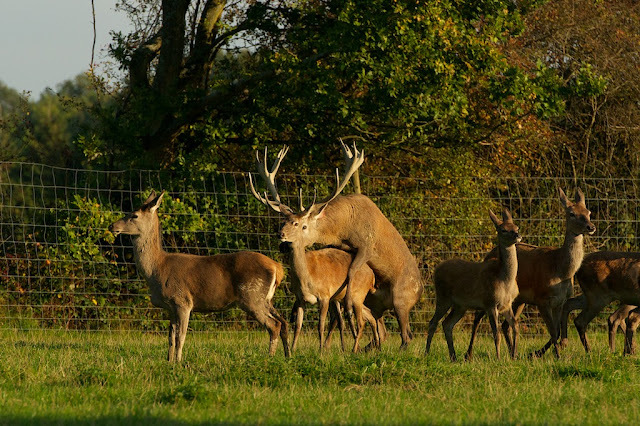 And this is what it is all for... a chance to mate with the females when they are in season, so that later the following year they are the father of the calves. Isn't she lovely?.. Worth competing for. So this year our Master Stag is Albus Dumbledeer, and with out doubt he will be the one to mate with the hinds. 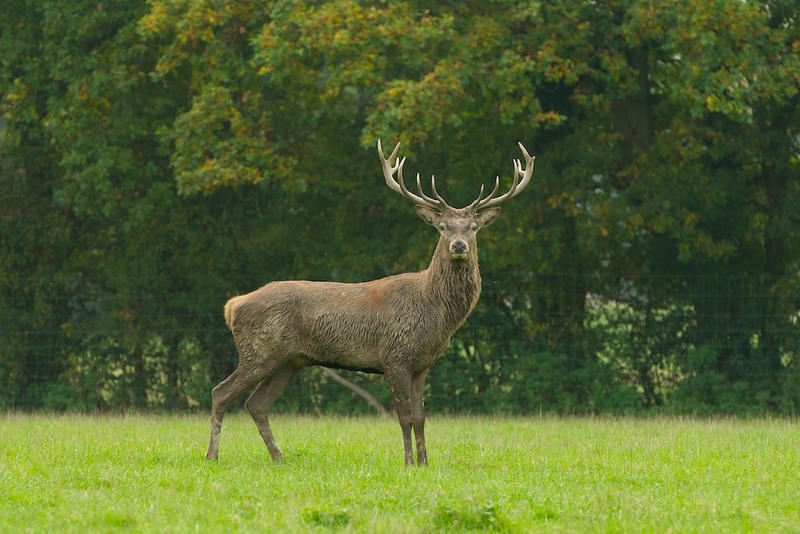 His challenger is Olivandeer, but as you can see he is still a bit smaller than Albus and not as bulked out at all. Will he challenge this year?.. Well, he hasn't yet, and I doubt he will. 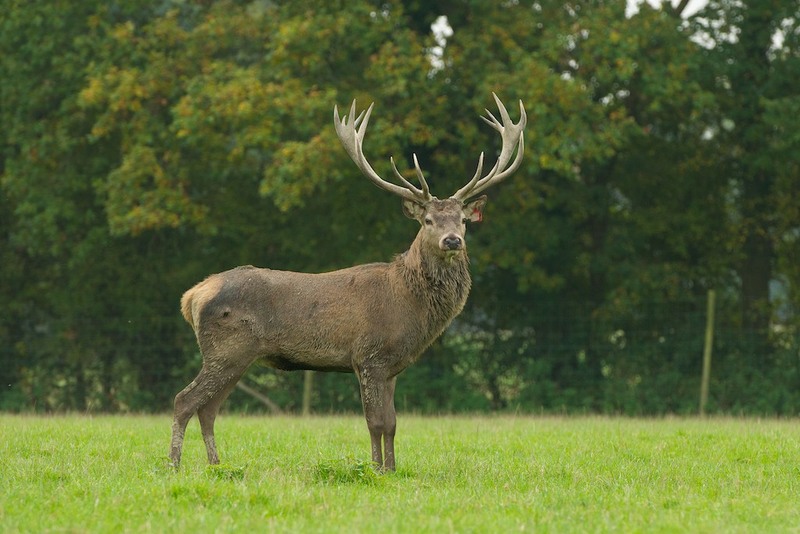 But next year he will be catching up in size, have a wider spread of antler, and so maybe... just maybe fancy he chances a bit. 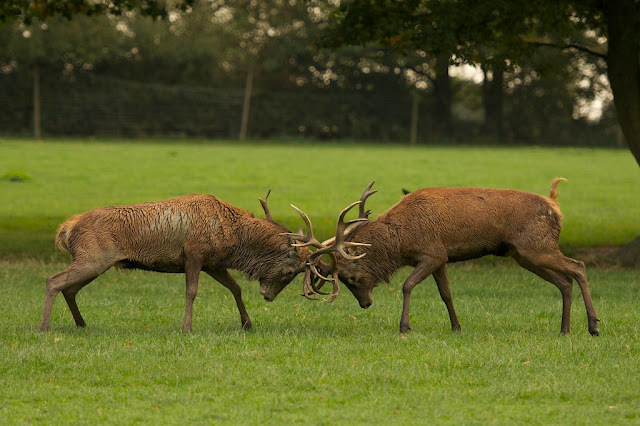 If he does, we will have clashing of antlers on our hands again, and hopefully be able to get some new photos.